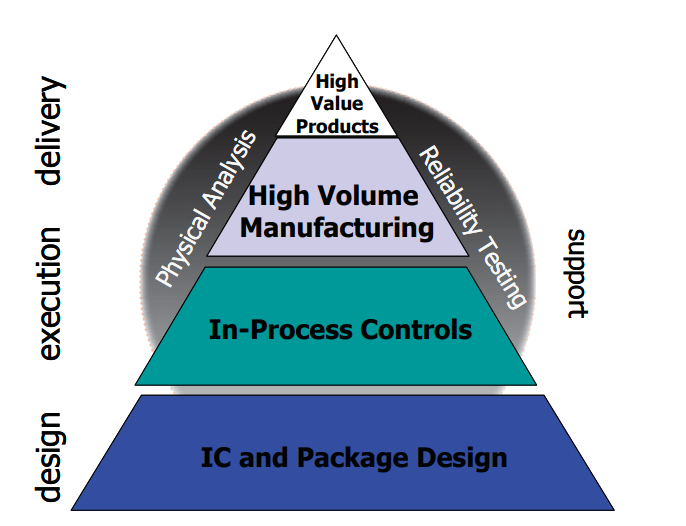 Mini-Circuits is committed to building products which meet or exceed customers' expectations. As we are ISO 9001:2000 and ISO 14001:2004 certified, we produce products using the highest quality and reliability standards. This paper will highlight key differences in the approach between Mini-Circuits' and typical market products. To be the world leader in RF and microwave products, we always insist on consistent performance, world-class quality and outstanding reliability in our products. As one of the few suppliers who own and manage their design and manufacturing facilities, Mini-Circuits is able to provide the most consistent, highest quality products to our customers. The EXTRA-RELIABLE Amplifiers (ERA) Series amplifiers are based on InGaP HBT (Heterojunctionbipolar-transistor) technology and achieve wideband high gain performance via a Darlington configuration. HBT technology provides many benefits that are not available in commonly used MESFET devices, namely single supply voltage operation and unconditional stability through the entire amplifier frequency range. Heat sources are separated to minimize heat coupling. Double bonds on ground provides better grounding and heat dissipation. Mold compound - 2 times more thermal conductivity compared to the typical market product. 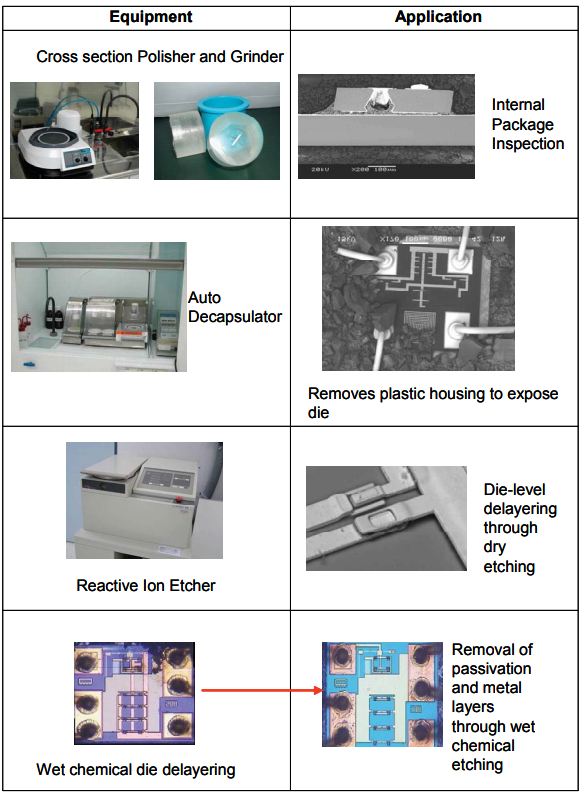 Silver Epoxy - 18 times more thermal conductivity compared to the typical market product. Leadframe - 18 times more thermal conductivity compared to the typical market product. Wafer maps provide the location of specific die with specific performance features, allowing us select the die we need to meet packaged device requirements. This enables us to deliver production lots with customer-specific or tight performance distributions. We use mold compounds, lead frame materials, and package designs with excellent heat dissipation properties, that improve product performance and long-term reliability, and that also meet regulatory requirements. 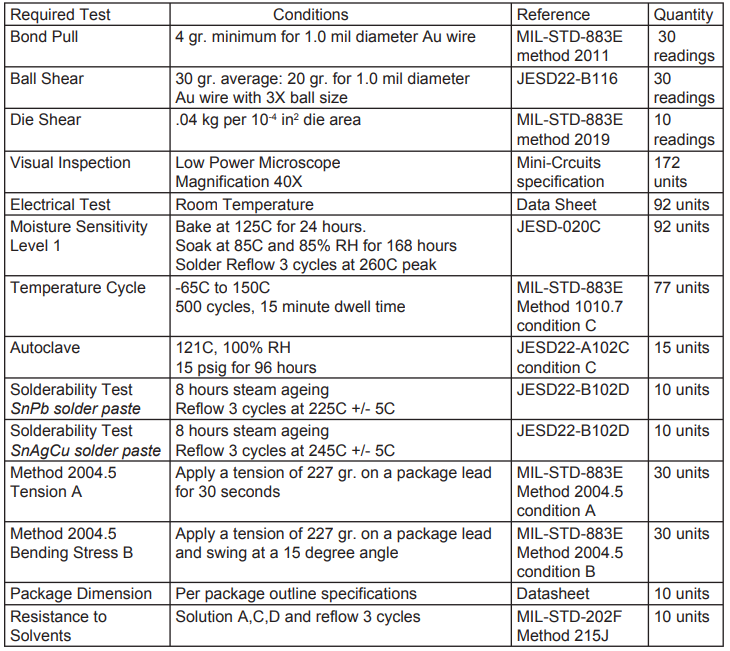 All Mini-Circuits semiconductor products are offered in RoHS compliant models. 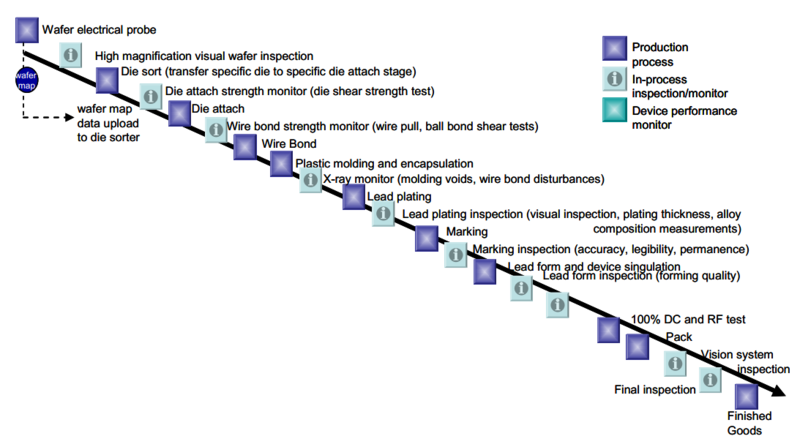 Benefits: Our extensive in-process controls provide early detection of process variation and potential quality issues, providing crucial information for real-time process corrections. Diagram illustrates 4.5 sigma limits used instead of specification limits. Only products from the shaded area for lot 1 will be tested good and shipped to customers. Diagram illustrates 4.5 sigma limits used instead of specification limits. 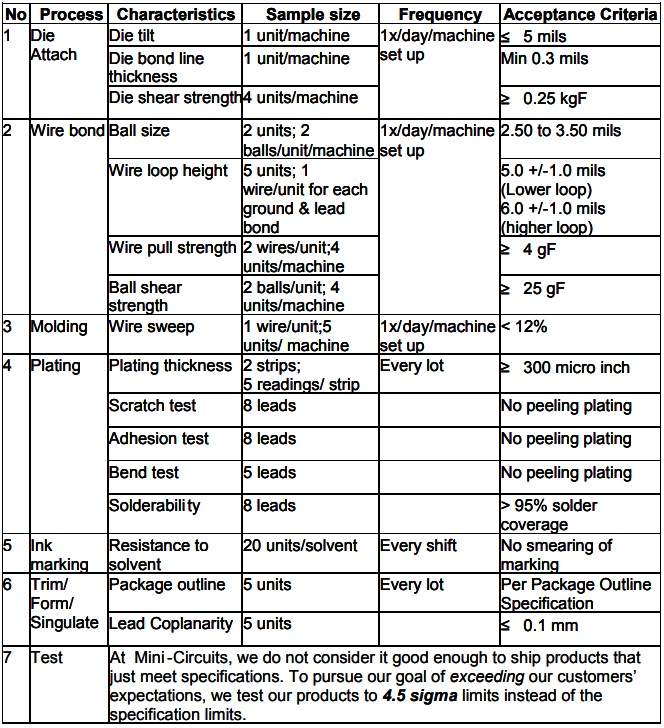 Only products from the shaded area for lot 3 will be tested good and shipped to customers. Our Reliability Database captures and tracks the reliability performance of our manufacturing lots over time. This database provides a complete record of each product's reliability history. 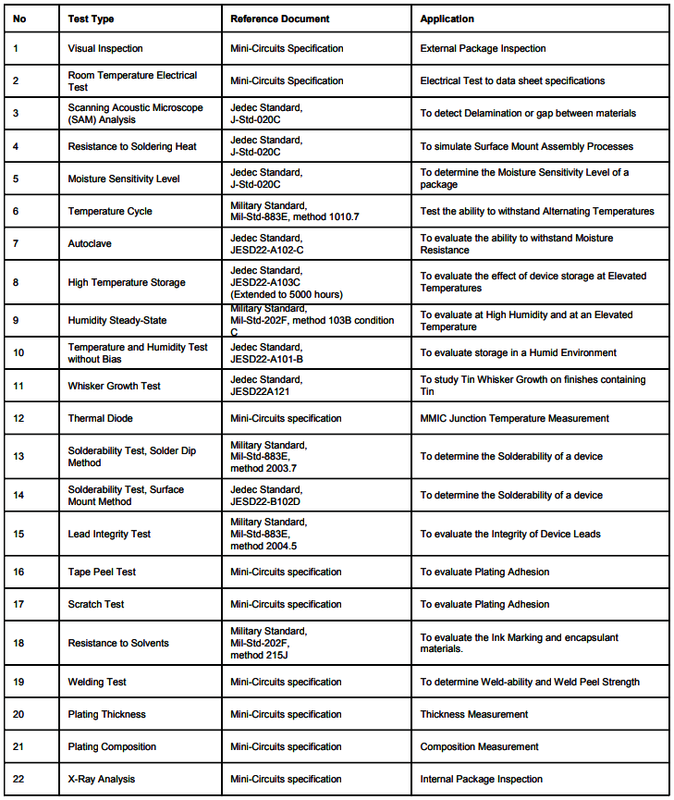 Example: Moisture Sensitivity Level 1 (MSL 1) rating in accordance with IPC/ JEDECSTD-020C. 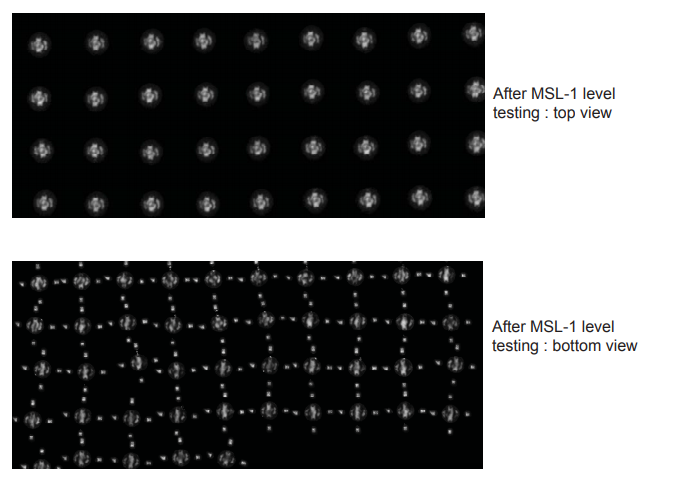 The following shows C-Mode Scanning Acoustic Microscope (C-SAM) photos of a device before and after moisture sensitivity level 1 (MSL 1) tests. 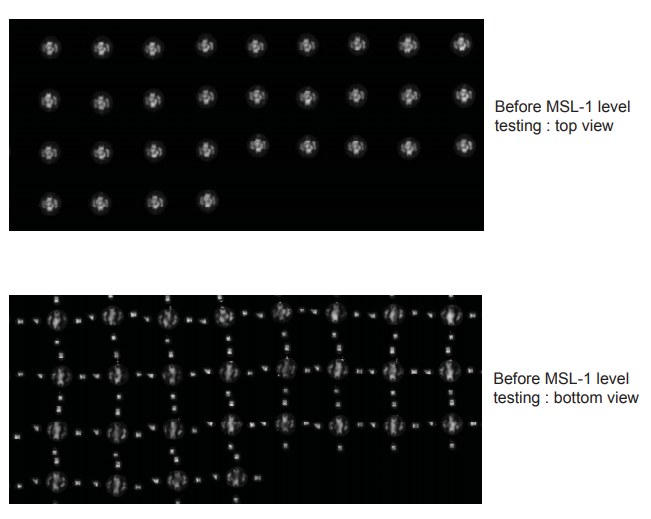 The table below shows delamination determination after MSL 1 pre-conditioning tests. 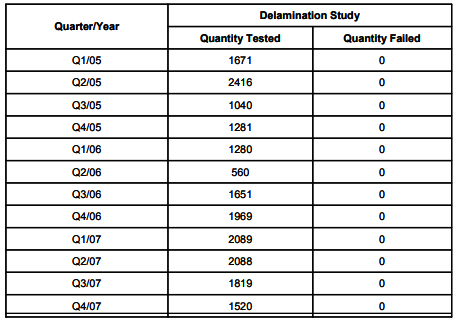 Monitoring results have shown no delamination detected over the past 3 years.